In an inaugural joint venture between NCCCP and SCCP-Pacific, Drs. Patricia Montgomery and Kimberly Hawk introduced an audience of 98 primarily first year students to the field of clinical pharmacy by sharing what brought them into the profession and describing the work that they do. 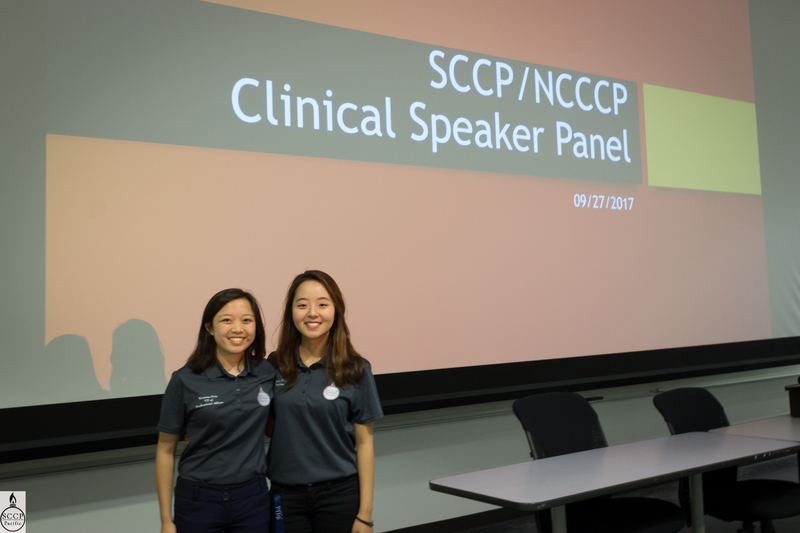 The NCCCP pharmacist speakers also discussed changes they see coming for the profession, offered tips on getting a residency, and explained what they feel sets ACCP and NCCCP apart from other organizations. NCCCP CE Coordinator for the Greater Sacramento Area, Patricia Montgomery, Pharm.D. (left) and NCCCP member Kimberly Hawk, Pharm.D. (right) speak about the arc of their careers and their view of the profession’s future. Nearly 100 primarily first year pharmacy students at the University of the Pacific attended. Topics covered included the day-to-day aspects of clinical pharmacist careers, the future of pharmacy, tips for getting a residency, and benefits of ACCP/NCCCP membership.